Headquartered in Lake Buena Vista, Smart City designs, installs and maintains wi-fi and data systems for major stadiums, ballparks, convention centers and outdoor venues throughout the U.S. — ensuring that customers’ smart phones stay connected when they’re watching a ballgame or strolling through an amusement park. In 2015, 35 of the largest indoor facilities in the nation used the company’s telecom services during more than 3,000 events. “Smart City has provided telecom services for the last three Super Bowls, the last five NCAA Final Fours, and eight Republican and Democratic National Conventions,” says CEO and founder Marty Rubin. Smart City started in the basement of the Astrodome in 1994 as the phone company for the Houston Astros baseball team. Orlando-based EnableSoft is a pioneer in the field of robotic process automation. The company’s Foxtrot software enables banks and other businesses to create a robot, or “automated employee,” that can enter data more efficiently and accurately than a human. EnableSoft has more than 500 banks and 21 major health care providers under contract. The dominant telecom trend today in Florida involves mergers with out-of-state companies, says former Public Service Commission member Lila Jaber, an attorney in Tallahassee with the Gunster law firm. The recent acquisition of Verizon’s wire-line assets in Florida by Connecticut-based Frontier Communications is a big plus for customers, says Jaber. “That merger is going to allow Verizon to concentrate on its wireless services, while giving Frontier an opportunity to focus on its wire-line and broadband and grow its footprint in Florida,” says Jaber. Other recent deals include Connecticut-based Charter Communications’ purchase of Brighthouse Networks’ Florida cable and home phone service assets. A month after Comcast and Time Warner, two of Florida’s largest cable providers, announced in April 2015 that they had terminated their merger plan, Charter announced a deal to buy Time Warner Cable. “There you have an acquisition on the cable side of the telecom industry,” Jaber says. Internet analytics company comScore notes “modest evidence” of slower growth in smart phone ownership. “This could suggest a saturation point has been reached among equipment manufacturers of smart phones,” according to a company report cited in the Public Service Commission’s 2014 report on the telecommunications industry in Florida. Apple and Samsung remain the dominant leaders, maintaining 41. 6% and 29.7% of the market share respectively, according to comScore. The Legislature approved, and Gov. Rick Scott signed into law last year, a bill that reduces the standard communication services tax from 6.65% to 3.05%. The Legislature cut the tax rate on direct-to-home satellite services from 10.8% to 7.2%. The bill also lowers the percentage of direct-to-home satellite tax revenue allocated to the state, from 63% to 44.5%. That change ensures that local governments will continue to receive the same amount of distributions as they receive under current law. The number of land-based phone lines across Florida has been shrinking steadily for years, with 480,000 fewer land lines during 2014 compared to the previous year, according to the Public Service Commission’s annual survey of Florida’s telecom industry. But land-line providers are not going away, says former Public Service Commission member Lila Jaber. In 2014, the Florida Public Service Commission reported that combined traditional wire-line access lines for Incumbent Local Exchange Companies (ILECs) and Competitive Local Exchange Companies (CLECs) declined 17% to 3.8 million as of Jan. 1, 2015, compared to 4.5 million wire lines as of Jan. 1, 2014. Most of the loss in wire-line customers was the result of less demand by business customers. Of the large incumbent carriers, AT&T and CenturyLink experienced the largest business line losses in 2014, totaling about 130,000 and 24,000 business lines respectively. Residential lines, which totaled 1.6 million as of 2014, fell by 16% from the previous year. From 2004 through 2014, wire-line residential access lines declined by 78%, or about 6 million lines. VoIP phone service, provided by cable providers, does not count toward wire-line totals. Level 3 Communications, the third-largest provider of fiber-optic internet access in the U.S., merged with TW Telecom in late 2014. As a result, Colorado-based Level 3 becomes one of the larger carriers in Florida. 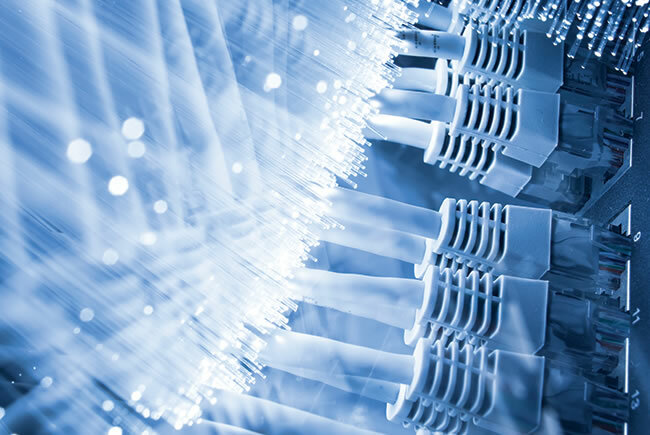 The combined company now owns more than 200,000 miles of fiber-optic network that connects some 50,000 business customers worldwide. Among its major customers are eight of the 10 largest U.S. banks and six of the world’s top 10 financial exchanges. There are an estimated 19 million wireless phones in Florida and an additional 2 million cable Voice over Internet Protocol (VoIP) subscribers, a combined number exceeding the population of Florida. More than 63% of Florida households have a broadband connection with download speeds of at least 3 megabytes per second, according to the FCC’s most recent report. AT&T Florida says its experiment to transition some of its customers from old copper wire phone technology to internet-based fiber networks has been a success. Now in its second year, the “technology trial,” one of a few authorized in the U.S. by the Federal Communications Commission, is focused on the small community of West Delray Beach. The goal of the ongoing trial is a smooth transition of all AT&T’s customers in West Delray — and eventually its customers statewide — away from landlines to wireless and fiber-based services. “That will enable us to focus all of our investment in this new technology, rather than trying to continue to maintain two networks operating in parallel with each other,” says Sadler. Wire-line business lines exceeded total residential lines. 10% Smart phone ownership in Florida has grown about 10% every year since 2009. By early 2015, 75% of all wireless users owned a smart phone.